High-End Modern Equipment. Better Data. Faster Service. More Reliable Delivery. Technology driven to ensure our Florida customers get the very best services available. We invest in technology because it allows us to provide customers with the latest, most meaningful services. Get the best vending machines with the latest advancements from cashless payment to wirelessly monitoring vending machines from our warehouse; we are well-equipped for today's demanding business needs. 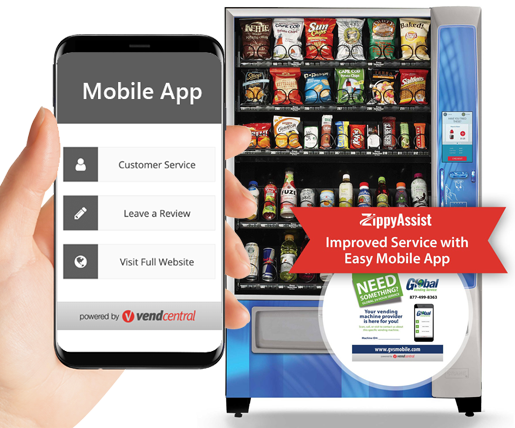 Read below to explore how Global Vending Service has transformed refreshment through the extensive use of technology in all that we do! 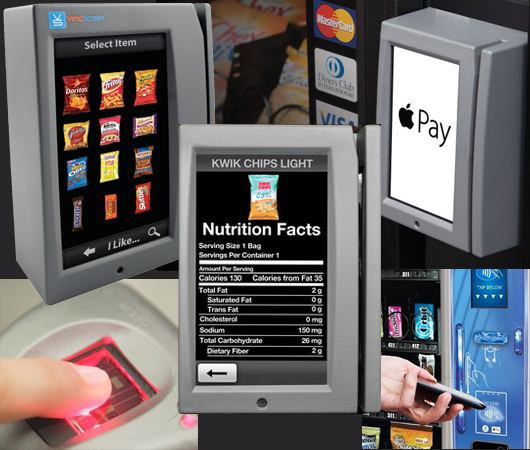 Our wireless remote monitoring system provides us 24/7, real-time, in-depth information about our vending machines. Through wireless data reporting, we receive up-to-the-minute overviews of sales, inventory levels, and malfunctions on our vending machines. This allows us to perform an in-depth analysis on each of our machines and locations which we then use to service our machines at the right time, provide our clients with the products they want most, and making sure to resolve problems before they become an issue. Remote Monitoring is one of the best vending machine technologies on the market because it keeps us up to date so you don't have to. With our automatic alert solution, we can monitor the condition of every vending machine at all times, so we know about problems before our customers do. Each machine has a remote data port installed which notifies us whenever a malfunction occurs. When a maintenance call is needed, the machine calls out to our network and contacts us so we can promptly expedite a technician to diagnose and correct the problem even before a customer calls to report it. All of our trucks are also equipped with GPS tracking devices. We know the location of our technicians throughout the day which allows us to respond to our clients' service needs in a timely fashion. With our GPS system, we have up-to-minute information on our technicians' activity such as service stops and variations in their routes. Our GPS devices help us service our customers with faster response times while improving our customer relations by providing our clients with in-depth information on arrival times and completion times for service calls. As technology progresses rapidly, consumers are becoming more demanding when it comes to having an engaging and interactive experience with vending machines. 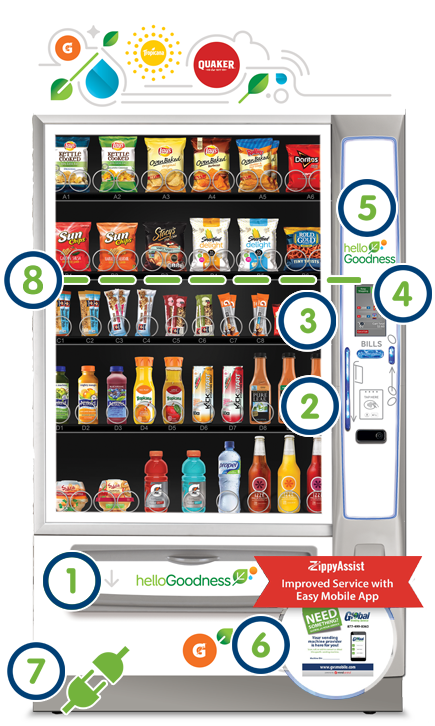 Our vending solutions go beyond traditional vending machines with our innovative unattended micro-markets, interactive touchscreen vending machines, and interactive nutritional information designed to help consumers make choices based on their diets. Don't normally carry cash? Convenient payment on all vending machines from credit cards to mobile wallets. Now users can communicate directly with our company via QR code instead of looking for a facility manager. We place only vending machines that have been built to meet Energy Star energy use standards. Just scan the code with a mobile device and your request will immediately be received. We will provide on-demand, fast response time to any issue, from a coin jam to a special product request. We can provide better, faster vending service, that will enhance your environment. No more fielding issues or concerns about vending service. Employees communicate directly with the vending company, so you can focus on your core business. Our Machines Talk: Giving our vending machines a "voice", helps Global provide faster, more reliable services. Our Machines Are NEVER Empty: Our telemetry system will alert us when product inventory levels need adjusting. We respond to inventory alerts immediately. Our Machines Give Rewards: The customer rewards programs built into our state-of-the-art equipment helps attract consumers and ensure loyalty. Our Machines Have Flexible Payment Options: Customers won't walk away if they carry large bills or don't carry ANY cash at all! Our Machines Are ADA Compliant: If you need services in a school, university, hospital or government agency, you can accomodate any and all special needs. Our Machines Can Help You Stay Healthy: Our interactive nutritional information tool is designed to help consumers make choices based on their diets. Our Machines Won't Frustrate You: With Sure-Vend technology, you'll avoid tedious service calls, failed vends, and unhappy customers.